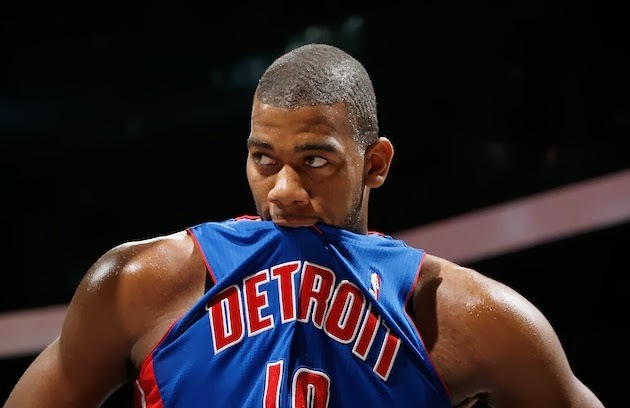 Greg Monroe has ostensibly been the face of the Detroit Pistons for the last three years, to the point that he engenders posts like "Trade Greg Monroe at Your Own Peril, Detroit". The overall praise is not entirely unwarranted: Monroe plays a dying breed of basketball that's designed to be both efficient and unstoppable. He's a promising young PF/C tweener with few comparables in the league. Unfortunately, the league is quickly transitioning away from Monroe's style and he's never been terribly efficient, in the first place. For a 6'10" big man whose offensive game centers on his post moves and no skills outside of three feet, that's a deplorable percentage. 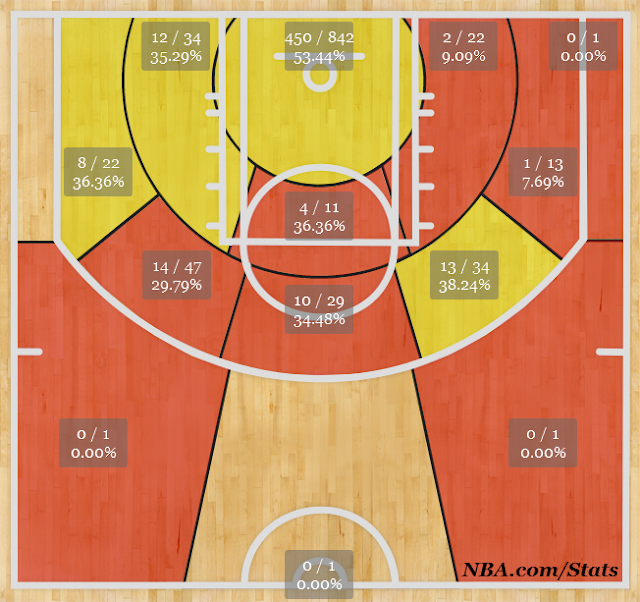 The problem for the Pistons is that the above shot chart is not that of a max contract player, which is what Monroe will be seeking following the conclusion of this season. Given Monroe's lackadaisical defense and subpar rebounding abilities, what you see above is what you get: this is not, say, DeAndre Jordan we're talking about who offers attributes other than scoring. Monroe's closest comparable is Paul Millsap: a score-first power forward who will give you a guaranteed 15 points per game but is a defensive liability and not someone you want to make the centerpiece of your franchise. Playing Smith alongside the Monroe/Drummond pairing was all that complicated measures. But if Joe Dumars can maximize Monroe's value and turn him into a talented small forward, Smiths' talents will easily replace the loss of Monroe and the Pistons will have yet another talented young asset with which to rebuild. With a suddenly cramped salary cap, signing Monroe to a max contract could hinder the Pistons' abilities to add pieces around the team's new core: Jennings/Smith/Drummond. That is, of course, unless Monroe makes the leap he was intended to in year three. Playing in a contract year can do that to players, but Monroe's prime real estate will be more crowded this season with Drummond and Smith on the floor, further slowing the already inefficient offensive threat. I firmly believe that the Pistons will deal Monroe this season, both out of necessity from a schematic standpoint and to maximize his value. His agent has said that he doesn't intend on signing an extension for Monroe during the season, which may prove to be the biggest hurdle in any trade negotiations. But I do not doubt that Monroe will quickly see that the on-court product no longer makes him the centerpiece of the offense. While he is every bit the #2 guy you want on a championship team, Drummond, Jennings, and Smith are all alpha dogs that will quickly push Monroe out of the discussion. While he's in a Pistons' uniform, Monroe will remain a frustrating albeit entertaining offensive threat. But how he, Drummond, and Smith fit together in the frontcourt remains the team's biggest question, an answer which likely comes down to dealing one of them: in this instance, Monroe is the only viable option. Simply put, Monroe is not worth max contract money to a team with an all-star caliber power forward and emerging superstar center. If the Pistons can maximize Monroe's value and trade for draft picks or a game-changing small forward (please don't be Rudy Gay, please), he could prove to be the piece that the Pistons need to get over the hump.